In what’s proving to be a trend for 2016 TV premieres, Outsiders is better than its marketing. Showing the struggle between a sleepy Kentucky town and the clannish folk who’ve lived an insular existence on top of the nearby mountains, the series is being sold with a lot of exoticism, and a lot of “it’s like [popular genre show] meets [other popular genre show]” hype. (Feel free to plug in the likes of Justified, Sons Of Anarchy, Banshee, Vikings, or another grim cable action-drama of your choice.) The network’s even pushing a hashtag based on the hill-dwelling Farrell clan’s rallying/drinking cry “Ged-gedyah” (which promotional materials prosaically translate as “Hell yeah”), positioning Outsiders as a rather more exuberantly crowd-pleasing show that it turns out to be. Not that Outsiders is free of down-home rambunctiousness. The Farrells—introduced good-naturedly beating the hell out of each other at the unveiling of the clan’s newest batch of moonshine—are of the “colorfully dangerous” school. One of the interbred extended families that have lived in near-complete isolation on the fictional Shay Mountain for 200 years, the Farrells practice their own form of frontier justice, have very few dealings with the outside world, and disdain both guns and money. Headed by wizened matriarch Lady Ray (a formidable Phyllis Somerville), the clan is content to brawl, breed, and hunt in isolation. Their very occasional trips down into town to pillage things they can’t make themselves are viewed by the wary townspeople as a fact of life, with everyone from shopkeepers to beleaguered local deputy Wade (Top Of The Lake’s Thomas Wright) eager to write off the Farrells’ raids as a small price to pay to keep the peace. Not that the Farrells and the town don’t have their internal troubles: The return of decade-absent Asa Farrell (Joe Anderson) and the wandering eye of Farrell rapscallion Hasil (Kyle Gallner) both set cross-cultural conflicts in motion. 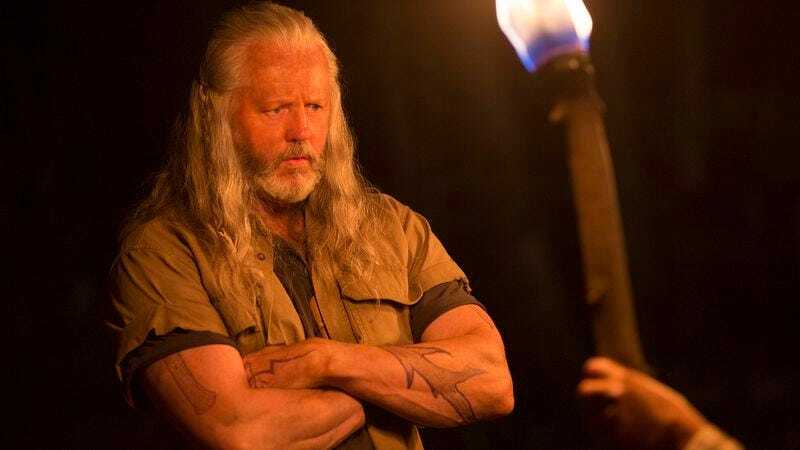 Meanwhile, David Morse’s long-haired alpha Farrell, Foster, stings from Lady Ray’s sudden decision not to abdicate her leadership position (“Bren’in,” in Farrell lingo), taking ill-advised actions to preserve the clan’s way of life that appear more likely to hasten its demise. Fortunately, the performances ground all of this. Eschewing the expected garrulous ruralisms, Outsiders’ cast prevents the show from slipping into camp. Morse and Hurst are brilliant casting as Big and Little Foster, with Morse’s devious bluntness as the clan’s would-be leader. His sad eyes and soft voice (here with a courtly accent) temper his apparent outright villainy with a lifetime of disappointment and self-doubt in the face of what seems like certain failure. Hurst matches him perfectly, Little Foster’s burly berserker burdened with an easily wounded soul all too susceptible to his father’s manipulations. Anderson’s Asa, who spent six months in a cage to atone for his 10 years in the outside world, is a compellingly conflicted hero, and his torn loyalties make him the unwilling key to defusing the coming conflict. Bringing a subtle drawl to Asa’s clench-jawed speech that mixes a McConaughey twang with a hint of the menace Anderson previously gave Hannibal’s Mason Verger, the actor makes Asa unpredictable enough to keep him interesting. And Alexy’s G’Winn is as sensible as she is steely, similarly imbuing what could be a stock character with compelling agency as she measures her options. (One of the most interesting aspects of Farrell culture—and Outsiders as a whole—is how women in its world mark out their territory through necessary grit.) Even the seemingly extraneous Romeo And Juliet subplot between Hasil and townie Sally-Ann remains viable, thanks to Gallner and Christina Jackson, who make the unlikely courtship between impetuous hillperson and wary cashier feel mutually liberating, and improbably sweet. Naturally, the real outsiders are the coal people, who are marked as the true villains of the piece as soon as they refer to the “retarded hillbilly animals” living on the mountain. (One of the execs even uses the word “irregardless” to signal their boorishness.) Outsiders’ depiction of the uneasy truce between the factions of this insular little world never come off as more than narrative contrivance, but the relationship between the Farrells and the townspeople sets up a compelling arrangement that the rapacious, glad-handing corporation is clearly inferior to. As Haylie, the company’s ambitious PR wedge, Francie Swift creates a uniquely hatable villain, her fake self-effacement (“I want your feedback on a dumb little idea of mine”) expertly deployed to manipulate the impoverished locals into turning on the Farrells. Caught in the middle as much as Asa, Deputy Wade sweats out the seemingly inevitable bloodshed with an affecting decency that he tries to numb with booze and pills. And while the townsfolk engage in the expected prejudices against the Farrells, the strained marriage between Wade’s sister and brother-in-law (Rebecca Harris and Jeb Kreager) puts a hearteningly human face on what could have been a predictable storyline. There’s a fair amount of moralizing in Outsiders, and romanticizing of its rural “regular folk” (from the town or the mountain): Asa looks on in bemusement at a shrink-wrapped piece of fruit and a cashier’s inability to get it to scan; parents explain how their lawyer told them not to reach out to another family in grief; and Farrell culture under Foster yields to a brutal form of justice. But the world of the show feels lived in, especially once it discovers its sense of humor, evidenced by an escalatingly destructive drinking-and-bonding session between Foster and Asa. For all its essential artificiality, Outsiders’ cast resolutely keeps things natural.